Super Swamper Vampire ATV Tires - Review and Best Deals. 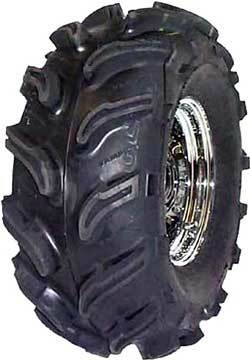 The Super Swamper Vampire ATV tires attempt to bridge the gap between all terrain ATV tires and pure ATV mud tires. They are heavier, tougher, have deeper lugs, and better self cleaning ability than the standard Super Swamper ATV tires. That covers the ATV mudding side of things. Unlike more aggressive mud only quad tires, The Vampires are capable of more normal trail riding without beating you and your four wheeler to death. They ride plenty rough but that and the rate of wear are reasonable. The 28's with the 2" lugs may be an exception to that. Great Deals on Super Swamper Vampire ATV Tires! The Super Swamper features 2" lugs. Traction in your typical ATV in mud situation is far better than any all terrain ATV tire. Fact is - they're awful close to the High LIfter Outlaw ATV tire in anything but ridiculous mud bogs. For a lot less money! We wouldn't call them cheap ATV tires but would call them a good value. There is a noticeably heavier feel and I'm sure they take more power to turn than lighter tires. That's just part of the trade-off for tougher sidewalls and better run-flat ability. Wheelies will probably be out! This is the serious ATV mud tire of the line. A full 2" Extra Deep Lug (EDL) makes sure everyone knows it! It's a heavy tire designed to get to the bottom of the mud hole and hook up to a solid base. The EDLs are a favorite in mud bog competitions that run in man made pits. These pits usually have a solid base and lots of water on top. The narrow width, weight, and lug design of the Vampire work well to cut through the water quickly and find traction in the bottom of the pit. In thick, slimy mud with no solid ground underneath - they don't work as well as something like the High Lifter Outlaws. Deep ruts with soft sides can be a problem too due to the lack of sidewall lugs. Just keep in mind the EDL is a much more specialized ATV mud tire than the other Vampire models. The Vampires are so strong they continue to run under most load conditions even when punctured. The tire will almost always get you back... even without air. Based on the Super Swamper tread design but engineered for muddier conditions. Spaced out lugs provide even better clean-out. Overlapped lugs are great in every terrain. Designed with a 1'' deep lug. 2'' deep lugs on the Vampire EDL 28''! 4-ply rating that makes it flat resistant. The 28'' Vampire, with 2'' lugs mainly designed for mud, will give a rough ride on hard terrain. Sizes available - (22-12.5-9) to (28-10-12). Super Swamper Vampire ATV Tires - Conclusion. These ATV mud tires are worth a look if you ride in muddy conditions often but still need some normal trail riding ability. You gain a lot more in mudding capability than you give up on the trail riding side. They are heavy and the larger sizes will hurt your ATV's acceleration but that goes with the territory. There were some quality issues reported in 2008 with some sidewall blistering, but that seems to be worked out now. The Super Swamper Vampire ATV tires run a little smaller than the stated size so you may need to compensate for that by going one size larger. The price looks good so we think they definitely deserve a recommendation!